The initial phase covers all aspects of flight, starting with general handling in flight and progressing through emergency procedures to take-offs, landings and circuit work. You will learn how to fly the aircraft safely; deal with any emergency that may arise, and safely land the aircraft every time. Typically, this last one is the part that takes the longest. Your instructor will not allow you to fly solo until s/he is convinced that you are capable of this.. Most students will require more than the minimum to do this, typically 15 -20 hours total dual. Some may take longer, but sooner or later it will happen! After approximately 15hours training, depending on commitment and aptitude, you could be flying solo. Once your instructor has cleared you for solo flight, you will spend a few hours getting used to flying without the reassuring bulk of an instructor on board! You will be sent on short navigation exercises to familiarise yourself with the local area and to give you confidence that you can find your way back to your home airfield (that is the scary part for most!). Finally, you will be sent on your first solo cross-country flight, where you will be required to find your destination airfield, join the circuit, land, sign the visitor's book, pay the landing fee (remember to bring some cash), then take off and return home. You will do two of these flights. Typically, the first is slightly scary, the second is fun! Finally, you must pass the GST - this demonstrates your competence and safety as a pilot. You will be required to show not just that you can fly competently, but can respond safely to any one of a number of emergencies thrown at you by the examiner. You must also demonstrate a high level of airmanship. 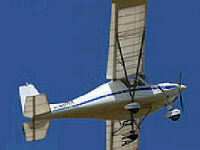 To obtain your licence you are required to fly a total of 25 hours, of which 10 must be solo. Once you have passed ground exams, you are then free to fly anywhere in the British Isles and Europe subject to normal air rules. * 15 hours dual instruction (this is the minimum required to complete the BMAA syllabus) * 10 hours supervised solo instruction including two qualifying cross-country flights. * Exams (Air Law, Aeroplanes Technical, Navigation, Meteorology, Human Performance and Limitations) * A pass of the General Skills Test (GST) * You must be at least 17 years of age * You must have a Declaration of Medical Fitness signed by your GP or other authorised medical practitioner. Note:You can not fly solo until you have passed your 17th Birthday. Note: Prices based on 15 hours Dual Training and 10 Hours supervised solo. More hours can be purchased as necessary. Exams: Exams are multiple choice and taken at the school. Exam tuition(160UKP - 6 evening classes) and Exam fees(35UKP per exam) are not included.